Bibliovore is a free Windows 8 eBook Reader App. You can use this app to read your eBooks quite easily. This app has support for one of the most famous eBook format, ePub. There’s also an option to add any eBook you are reading using this app to favorites. The interface of the app is very good, and would give you an overall engaging experience while reading. Bibliovore also has the option to open eBooks that may be present on your SkyDrive account. The app also gives option to directly upload any eBook to your Skydrive account, from where you can access it anywhere at anytime. 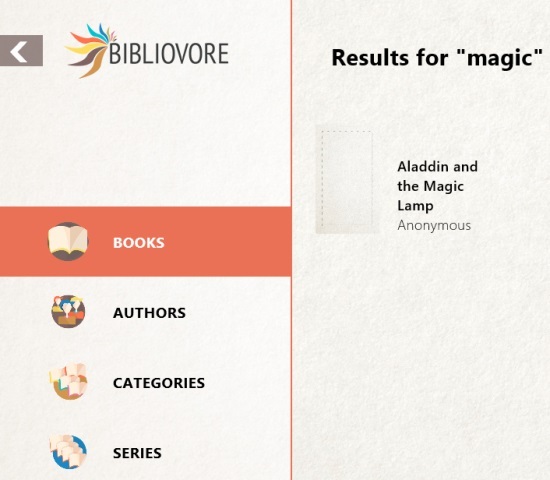 Bibliovore is freely available in the Books & References category of the Windows Store. On the main page of the app, all the eBooks that you are reading using the app will be shown. There are many ways by which you can access the eBooks to read. For that use the options that are present in the vertical panel in the middle of the main menu screen of the app. The first option will show you all the books according to their names. From there, you can access the book you want to read. The second option will show you the books on the basis of categories and genres. Example are Fiction, history, Comedy, Adventure, Fantasy, and many others. From the third option that is available here, you will be shown the authors whose books are available in the app. The fourth option will show you the series that are present in your app, if any. You can use the upper flyout of the app to access the books. The upper flyout will appear if you right click anywhere on the app’s interface. Search option that is available in the upper flyout, can be used to search for any book on the basis of its name, author’s name, and the genre of the book. You can also search using the keywords. You can set pages to your favorites. You can readily access these pages. This may be important if you want to mark the page you were reading , which you might want to access later at some point of time. The only thing you have to keep in mind is that you can view the bookmarks for a book in the book itself. For this, you can use the page icon that is available on the top right side of the page you are reading. The page will be added to your favorites. Thereafter, you can use the upper flyout to see your favorites and access them. You can change the font size of the text you are reading. For that, the option is available in the bottom flyout of the app, on the left side. The table of content option that is available in the top flyout of the app on the right side can be used to access the index of the eBook you are reading. Also check Book Bazaar Reader, Alexandra Reader, and Liberty Book Reader. Support for ePub, one of the most famous eBook format. You can add favorites which you can readily access using the app. Option to change font size of the text. The app is for free in Windows Store. 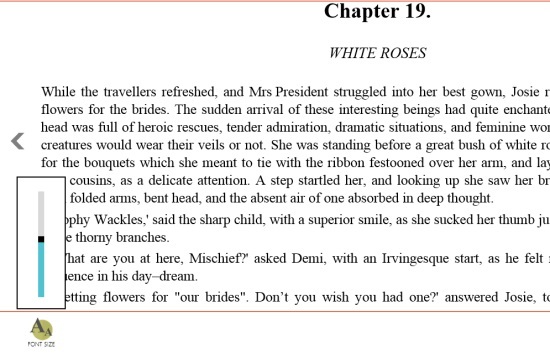 Bibliovore is a nice Windows 8 eBook reader app which can be used to read eBooks. The interface of this app is quite nice. It will provide you with a number of options like changing the font size of the text, and adding favorites. This all makes it a must try. 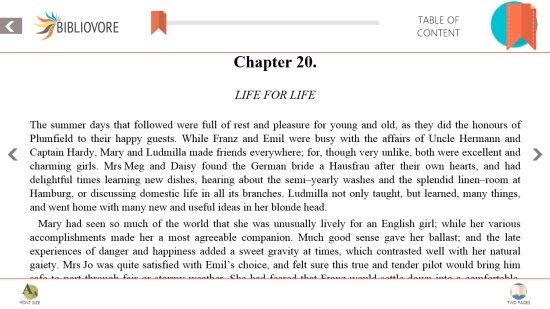 You can access the option through the menu while reading a book (right click or swipe from the bottom of the screen).